Invite Connections or Co-workers on your People page or view Predicted profiles through our Chrome Extension. Invite Connections - invite someone to join Crystal or connect with a Crystal user and see their basic profile for free! View Your Co-workers - If you are apart of a company page, you can view your co-worker's profiles for free. Anyone on the co-workers tab is a Crystal user from your company. Chrome Extension. 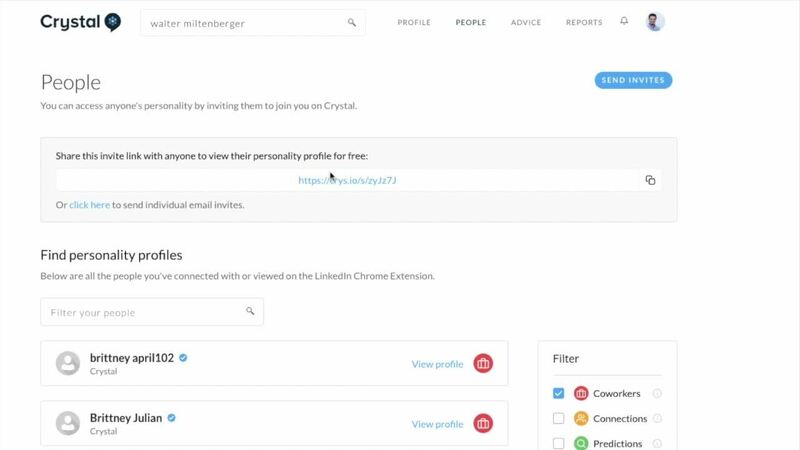 - You can access predicted personality profiles via Crystal for Chrome: Crystal works with many integrations like LinkedIn, Salesforce, Outreach, Insightly, Hubspot and Drift.